I wrote about Prosper.com in January. I had good things to say about it. While my experience hasn't changed, it appears that other Prosper users have been having a tough time. The Motley Fool recently reported that Prosper either lied to a court or its users about the nature of its business in a bankruptcy suit. The Motley Fool reported that since June 2008, 18.5% of the money lent out at Prosper probably won't be paid back. The article does not distinguish between the borrowers' credit quality. It might be that the riskiest loans are failing, which is no surprise. All my loans (I only lent to borrowers with the highest credit quality) have either been paid back in full or are current. So far I got a pretty good rate of return. Update: A big thanks to the person who left the comments below. I wrote previously that Prosper filed for bankruptcy. That isn't true. I bought some Fannie Mae (FNM) calls ten days ago. I just sold them for a 35.71% profit. They might go higher, but the original plan was for Fannie to be between $7 and $8 a share. It did that this morning. I put a stop limit at $0.95 when the calls traded for $1. I got stopped out at $0.95 shortly thereafter. 1. Don't jump into the trade right away. I should have waited a bit. For two days after I bought, FNM went down by double digit percentages. I could have bought the same calls at $0.50 or even $0.45 instead of $0.70. 2. Closer to the money calls would probably be a better idea. I bought the $0.70 calls (Dec '08 12 strike) because they traded below the 13 strike (that was rather strange) and because I didn't want to lose much if they ended up going to zero. In retrospect, I probably should have bought fewer calls at the 6 or 7 strike. I'd probably save on commissions. Overall, though, I'm happy with my little gamble. Thank you Barron's for the scary article that'll probably turn out correct in the next couple of months. I wouldn't be surprised, though, if a government bailout rescues FNM and FRE shareholders. This country has always had a socialize the losses policy for "too large to fail" institutions. Update: The December '08 12 call closed at $1.49. My 35.7% gain is pretty good, but had I waited a while longer, I'd have doubled my money. Oh well. There will be other opportunities for gambling. If FNM goes over 10, I'm going to see about buying puts. A real estate boom spurred by unreasonably low interest rates and the collapse of lending standards leads to a bubble, which bursts. Over leveraged financial firms face staggering losses and struggle to raise capital. The government tries desperately to to prop them up as losses mount. Am I describing our current crisis, or Japan's 18 years ago? A number of experts, including Morgan Stanley's Stephen S. Roach, have compared today's credit mess with the bursting of Japan's real estate bubble in the 1990s. If the comparison is apt, investors in broad stock market indexes like the S&P 500 may be in for a tough decade. 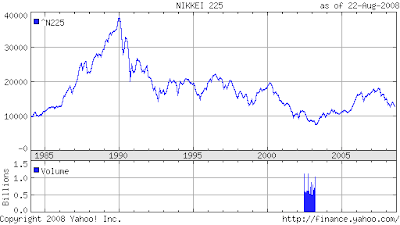 An investor putting a monthly amount in the Nikkei 225 before 2003 would be much better off keeping that money in a bank account instead. There's a reasonable chance that a decade from now the S&P 500's chart will look similar. The last ten years haven't been so great either. Investing a monthly amount into the S&P 500 from March 1998 through August 2008 would give you an annualized return of around 1%. A diversified portfolio, which, in addition to US stocks, includes bonds, REITs, international stocks, commodities and other asset classes would have done better. Putting equal monthly amounts into index funds tracking the S&P 500, bonds, international stocks, and REITs would garner an annualized return of around 4%. Certainly, 4% is nothing to brag about. But those three percentage points make a sizable difference. Investing $1,000 a month into the S&P 500 over the last decade would result in a portfolio worth a little over $132,000 today. Investing $1,000 a month split evenly between the four different asset classes would be worth a little less than $178,000 today. As retail investors (and most mutual fund managers) are terrible at picking individual stocks and market timing, index investing is the way to go. Just remember, don't put everything in one asset class. If we have a lost decade like Japan's, a diversified portfolio should offset losses in the US stock market. That's one of the ideas behind my ETF portfolio. In its first two weeks, it's lagging the S&P a bit. Come back every once in a while to see how it does.